We have some amazing applications coming in! It is very exciting!! Some of the best designers in the industry are inspiring us with their beautiful submissions!! I can't wait to look at my email box! The selection process is however always difficult with so many great designers to choose from! When you apply for a team you're putting yourself and your artwork out there for the everyone to see. I am always amazed at the submissions..so many truly great artists and I can only select a few. It's so hard to turn away some of the best of the best. I have been in the design world for years now, and I know that feeling when you get your hopes up and the excitement you feel when you get that email or phone call saying "Welcome to our Team". On the other end I know the disappointment of knowing you gave it your all and you don't get the call. I recently went through this and it was very difficult. It took me weeks to get over, but I'm still here and after a long break I decided that the rejection was not about me personally, it was about what I could not bring to the team. It was about where I lived...I lived in the US and that is not what they were looking for. So I have moved on and the old saying that when one door closes another opens, well that is what it did for me..so please don't ever think that you're not good enough! You are! Don't ever give up as there will always be another call! There are many considerations when choosing a design team. Deciding who and why are difficult decisions and they aren't always about who creates the prettiest projects. That is only one third of the decision for me. I consider several other things so please send in your application! You may be just the person we are looking for! You still have until the 25th to apply for our team so get those submissions in!! Here is the call again in case you missed it!! Do you love Chipboard ? 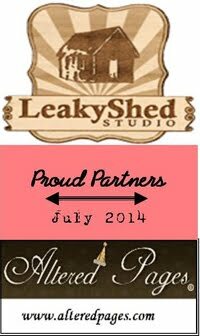 The Leaky Shed Studio is looking for designers to help us create amazing projects!! Designers will serve a 6 month term. We will compensate with our products. Open to all US designers who are at least 18 years of age. What we would like to see is 3 of your projects using chipboard, one being a mini album. You can submit up to 6 projects, but 3 are required. Projects can be previously posted online. If you have any questions please e-mail our design team coordinator at wyscrapper@gmail.com. Please e-mail your entry to: wyscrapper@gmail.com by midnight (mountain time) Friday, October 25, 2013. Please put "LSS DT Submission" in the subject line of your e-mail. Submissions accepted immediately. New designers will be contacted on or around Friday, Nov. 1st and the announcement will be made as soon as all designers have been notified. New term is from November 1st 2013– April 30, 2014. Altered items can be substituted for layouts. You will be required to post your projects on our blog with tutorials, video or step by step photo. Please note: We are accepting USA designers only at this time.